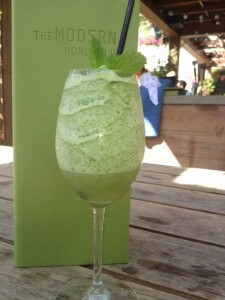 Party Girl Diet author Aprilanne Hurley shares her “skinny makeover” for the Modern Honolulu’s Blended Coconut Mojito. The key is to replace the Horchata (Rice milk made with sugar and cinnamon) with light Coconut Milk, which only has 1 gram of sugar per serving and is very, very low in fat. Definitely add a dash of cinnomon – which is calorie free and helps balance blood sugar. 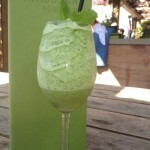 To make it a “Virgin” Coconut Mojito, replace the coconut rum with pineapple juice. To make the drink a bit more healthy, replace the coconut syrup with a (natural) sugar free variety, reduce the amount of coconut syrup used, or eliminate it completely. Aprilanne Hurley is Certified in Optimal Health, Wellness and Sports Nutrition through San Diego State University, and has received certifications as a Specialist in Fitness Nutrition, and Lifestyle Fitness Coaching. Aprilanne Hurley is the author of The Party Girl Diet, and the Health Expert for California Living® - a dynamic 11 year running Broadcast Television show featuring California’s trends in food, travel, and healthy living. Hurley’s media credits include LIVE TV appearances on ABC, CBS, NBC and Fox Networks to share her Party Girl Diet secrets, healthy lifestyle tips and deleicious recipes with viewers. 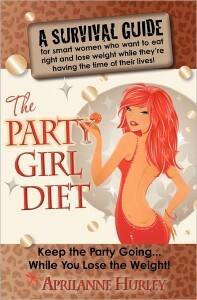 BONUS: Purchase the Party Girl Diet on Amazon.com and receive the Kindle Edition FREE through Amazon’s Kindle Matchbook Program. PLUS – Stay tuned for Aprilanne’s Hurley’s new book – the Aloha Diet coming to Amazon this year. 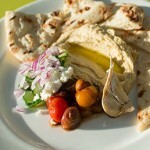 Hurley notes, “I am always looking to incorporate ‘local flavor’ and fresh, easy to access ingredients into the Party Girl Diet recipes I feature on my media tours. For Hawaii New Now Sunrise, I thought it would be fun (and so ono) to whip up a batch of the Party Girl Diet’s famous ‘Skinny Fudge,’ replacing the walnuts with rich, buttery tasting, roasted Hawaiian Macadamia nuts. It was at that delicious moment in time – the Aloha Diet’s “Mac-Nut Skinny Fudge” recipe was born. Hungry for healthy party food to eat on a diet? Score the Party Girl Diet’s Spicy Ahi Tuna Poke Recipe fresh from Maui, Hawaii – a recent destination on Party Girl Diet author Aprilanne Hurley’s healthy food & travel tour. You don;t have to travel to Hawaii to live the healthy Hawaiian lifestyle with the Party Girl Diet’s Hawaiian inspired Ahi Tuna Poke recipe – a healthy, fun and easy 10-Minute party food dish to serve up in a martini glass for extra flare. 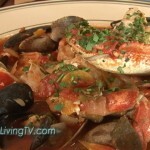 While many enjoy oysters in the raw, the healthiest way to to eat them cooked. Here’s a recipe for Oysters Rockefeller, a classic oyster recipe that is as healthy as it is delicious since the primary ingredient is spinach, one of The Party Girl Diet’s top 10 Food for health and longevity ~ bon appetite! 7/11/2011 – Waikiki, Honolulu, HI: Party Girl Diet Author Aprilanne Hurley Shows Hawaii News Now Sunrise Host Steve Uyehara and Viewers Easy Ways to Add More Health Boosting Color into Their Diets with an Anti-oxidant Rich Mocktail The “Aloha Sunrise,” Plus Fun Dishes from Her Book That Are Low in Fat and Big on Taste!